Fast Food News: BK Oreo Sundae Shake, Which is it? 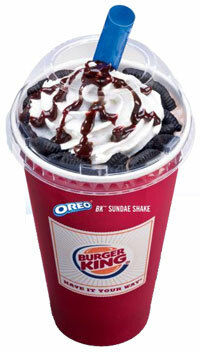 Burger King is now taking your vote on the matter of their Oreo Sundae Shake. Is it a Sundae, or is it a Shake? In addition to your vote, they're also taking your address, phone number, e-mail address and a couple other survey questions. At least they give you the option as to whether or not you'd like to receive "additional marketing communications about Burger King" or "ure correspondence from Kraft® regarding products and promotions." Oh, and a few nutritional facts about the Oreo BK Sundae Shake. The medium chocolate one conveniently gives you 100% of your recommended daily intake of Saturated Fat all in one place! It also supplies almost 1,000 calories and 32 grams of fat (that's half your daily recommended intake). * But heck, that all makes sense, the thing ways over a pound! Plenty of High Fructose Corn Syrup (HFCS) for all!